Love souvlaki? 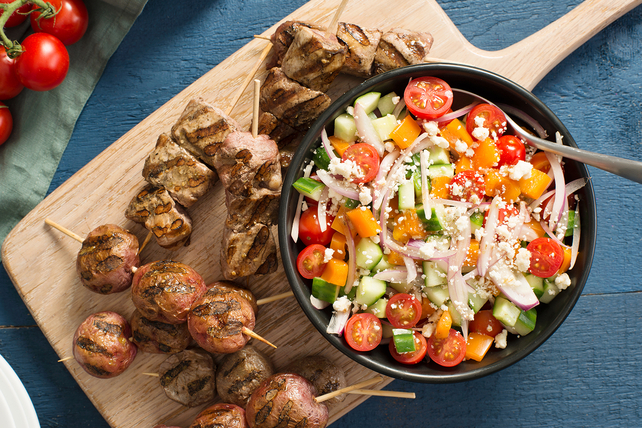 Try our Grilled Pork Souvlaki Dinner recipe. It’s simply delicious - the perfect choice for your next gathering. Pierce each potato in several places with sharp knife; place in microwaveable dish. Microwave on HIGH 6 to 7 min. or just until tender. Combine cucumbers, peppers, tomatoes, onions, cheese and 1/4 cup dressing. Thread potatoes onto 4 skewers; spray with cooking spray. Thread meat onto 4 separate skewers; brush with remaining dressing. Grill all skewers 13 to 15 min. or until meat is done, turning after 8 min. Serve meat and potato skewers with cucumber mixture. Add 1/4 cup pitted Kalamata olives to cucumber mixture before serving. Prepare using cut-up boneless skinless chicken breasts. For added convenience, the cucumber mixture can be prepared ahead of time. Refrigerate up to 24 hours before serving with the grilled meat and potatoes as directed.